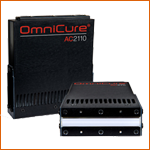 The OmniCure AC275 and AC2110 air-cooled UV LED curing systems combine a compact form factor with advanced front-end optics to provide high peak irradiance and exceptional uniformity. The OmniCure AC275 and AC2110 air-cooled UV LED curing systems from Excelitas Technologies combine a compact form factor with advanced front-end optics to provide high peak irradiance and exceptional uniformity. Multiple UV LED heads can be adjoined while maintaining optical uniformity between each system. The flexibility to achieve larger curing areas in a variety of customizable lengths enables manufacturers to improve throughput without compromising on performance. The standard AC2 systems provide a reduced output angle from typical LED systems, ideal for printing applications, to help eliminate back reflection of the light to the print heads. All AC2 Series come with a flat outer surface that allows for easy cleaning and replacement for ongoing maintenance. By adapting the output to support the process requirements of the industry, the new AC2 Series product portfolio can be applicable for a range of varying applications with different process needs.